Successfully Added 7 Inch TFT Touchscreen Car DVD Player + Bluetooth to your Shopping Cart. 7 Inch TFT Touchscreen Car DVD Player + Bluetooth. 2 DIN (100mm tall) multi-format playing car DVD with a fully motorized and touch screen controlled 7 inch TFT screen as well as Bluetooth enabled for pairing with Bluetooth mobile phones. Get the most out of your car entertainment with included TV tuner with NTSC, PAL, and SECAM reception, multiple input and output for attaching everything from rearview cameras to Sanyo 6 and 10 disc CD changers, and stay safe on the road with touchscreen dialing of your phone as well as an included MIC for handsfree talking. 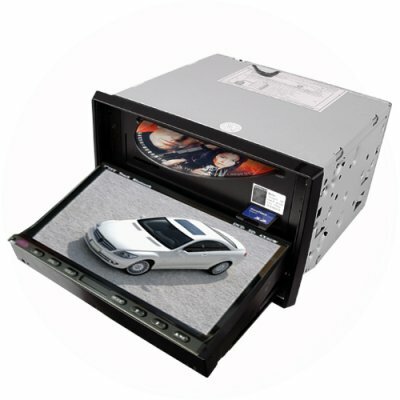 An all-in-one car DVD player for any car owner looking to really maximize their car's potential without breaking the bank at the same time. Another highly useful high-tech product only available at your source for factory-direct electronics, Chinavasion.